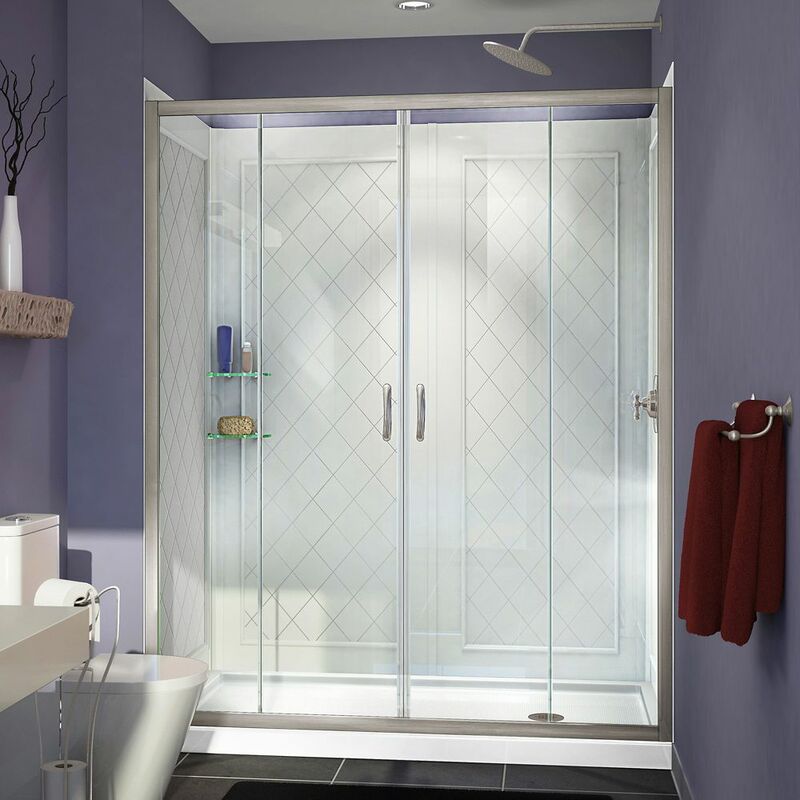 Visions 34-inch x 60-inch x 76.75-inch Framed Sliding Shower Door in Brushed Nickel with Right Drain Base and Back wall Kit The DreamLine Visions shower or tub door offers breathtaking style for your shower area. Visions features a unique design with dual sliding doors flanked by stationary glass panels to create an ample center point of entry. The Visions glides smoothly on sleek top and bottom rails, while the exclusive fast-release wheels make cleaning the glass and track a cinch. The included SlimLine Shower base features glossy acrylic finish that is scratch, slip, and stain resistant for safe showering. Base is reinforced with fiberglass for durability and requires direct-to-stud installation. Drain opening fits any standard 2 in. compression fitted drain (not included). Q-Wall Backwalls are a great alternative to expensive tile and will add a modern look with an attractive pattern and glass shelves. Backwalls are made of durable, easy to maintain acrylic and can be trimmed during installation to fit your shower space. Choose DreamLine for the ultimate solution to your shower project! Visions 34-inch x 60-inch x 76.75-inch Framed Sliding Shower Door in Brushed Nickel with Right Drain Base and Back wall Kit is rated 3.0 out of 5 by 3. Rated 3 out of 5 by Bhupesh from The surround wall panels are not what I expected. I... The surround wall panels are not what I expected. I was expecting better quality and thicker panels and the joints to not be so obvious and visible after installation. Rated 1 out of 5 by Wendy from Is not what is pictured on the website. Very angry... Is not what is pictured on the website. Very angry and disappointed in Home Depot! !